Tree loss in one of the world's largest rainforests has slowed, a study suggests. Satellite images of Africa's Congo Basin reveal that deforestation has fallen by about a third since 2000. Researchers believe this is partly because of a focus on mining and oil rather than commercial agriculture, where swathes of forest are cleared. The work is published in the Philosophical Transactions of the Royal Society B. It is part of a series that is examining the state of Africa's forests. Dr Simon Lewis, from the University of Leeds and University College London, said: "Most of the focus has been on the Amazon and on South East Asian tropical rainforests, and a big bit of the missing picture is what is going on the Congo Basin in Central Africa. "We really wanted to pull together information about this amazing region that we know very little about." This latest study, which was carried out by the European Commission's Joint Research Centre, reveals that it is in far better health than expected. They found that during the 1990s nearly 3,000 sq km (1,000 sq miles) of forest were being felled each year. But from 2000 to 2010, the rate of deforestation had slowed. Fewer than 2,000 sq km (700 sq miles) of rainforest were lost every year. "The results were surprising," Dr Lewis told BBC News. "This is partly because there is a network of protected areas. But it is also because of a lack of expansion from agriculture, and the way these [central African] countries have organised their economies. "They are very dependent on oil sales and also minerals from mining, and they are investing in that and not investing so much in agricultural expansion." Another study published in the same journal highlighted the differences between trees in the Congo Basin and those found elsewhere around the world. 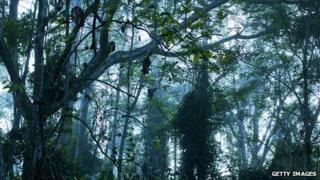 Measurements of 130,000 trees show that African species were on average much larger in stature than those in the Amazon. As a result, scientists believe that the Congo Basin stores more carbon, acting as a carbon sink. Losing parts of the rainforest would have an impact on climate change, biodiversity and the communities that depend on the environment, said Dr Lewis. He said that Africa's rainforest was at a pivotal point. Logging could continue to fall because of schemes such as the United Nations' Reducing Emissions from Deforestation and Forest Degradation in Developing Countries (REDD) that offer financial incentives to keep forests intact. "But on the other side, the big increase in human population and the rise in living standards globally means we may need more agricultural commodities... It could go the other way and go much more like South East Asia or the Amazon and see the expansion of commercial agriculture," explained Dr Lewis. However, the environmental group Global Witness said the current loss of forest was unacceptable. Alexandra Pardal said: "The world's second largest rainforest is losing 2,000 square km - an area 34 times the size of Manhattan - every year. This is totally unsustainable, and it's set to get worse."